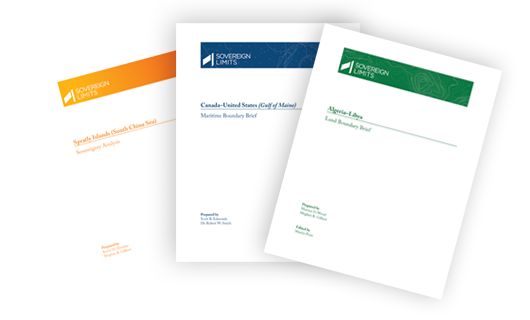 Membership to Sovereign Limits includes access to our invaluable Boundary Briefs. These briefs provide a concise synopsis of every established international boundary in the World, both land and maritime. Each Boundary Brief includes a history of key events, relevant excerpts from primary source documents, and illustrative maps created by International Mapping to provide the user with a comprehensive overview of any boundary in the World. Sovereign Limits has already done the research, all you have to do is pick a boundary. This page provides a sample of what our Boundary Briefs offer. Select a boundary from the column on the left to see an excerpt from the boundary summary, as well as a custom map. The complete collection of Boundary Briefs is available to every Sovereign Limits licensee. Click here to download a sample of full Boundary Briefs.